Concentrating Solar Power (CSP) systems use lenses or mirrors and tracking systems to focus a large area of sunlight into a small beam. The concentrated light is then used as a heat source for a conventional power plant. Though a wide range of concentrating technologies exist, the methods primarily used are the solar parabolic trough, parabolic dish, hybrid and solar power tower. These collection methods vary in the way they track and focus sunlight. In all these systems a working fluid (typical substances utilized are synthetic oil, molten salt and pressurized steam) passes through the system and is heated by the concentrated sunlight, and is then used for power generation or energy storage. Solar Parabolic Trough. Parabolic trough power plants use a curved U-shaped reflective trough which directs solar radiation to a collector (alternately called an absorber, or receiver) which is basically a pipe that runs down the center of the trough. A heat transfer fluid, typically oil, is heated as it flows through the pipe. The trough is parabolic in one direction and linear (typically in long, straight, horizontal rows) in the other direction. As the sun changes position orthogonally (ie, attempting to keep it perpendicular or at right angles) to the receiver, the whole trough tilts (or tracks) over the course of the day so that direct radiation remains focused on the receiver. A change of position of the sun parallel to the trough requires no adjustment of the mirrors, therefore no tracking mechanism on the second axis, since the light is just concentrated on another part of the receiver. Full-scale parabolic trough systems consist of many such troughs laid out in parallel over a large area of land, such as shown in the picture to the left. Solar Parabolic Dish. These systems use an array of mirrors, arranged in the shape of a dish (similar in shape to a satellite dish), to concentrate sunlight onto a receiver placed at the focal point at the dish center. The heat produced by these systems is transferred to a heat engine which converts the heat into mechanical energy. This energy then drives a generator to produce electricity. Power or Central Tower type. A power tower or central receiver system uses a large array of mirrors to concentrate sunlight onto the top of a tower, where the receiver is situated. Molten salt is heated at it flows through the receiver, and the salt's heat is used to generate electricity through a conventional steam generator. Molten salt is the heat transfer fluid of choice as it retains heat efficiently, so it can be stored for days before being converted into electricity. The result is that electricity can be produced on cloudy days or even several hours after sunset. Hybrid Systems. A hybrid system combines power towers with natural gas generators, thereby creating a system that can continuously generate electricity, with or without sunlight. This is an experimental technology and still in the research and development stage, with a few experimental systems being utilized in conjunction with utility companies in the Southwestern deserts. The most significant advantage of CSP over conventional power plants is that the electricity generation is clean and carbon-free. 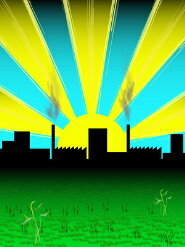 To produce electricity your power company usually burns coal. Burning coal can put hazardous gases into the atmosphere and cause problems with the environment. Secondly, given that the sun is the energy source, there are no fuel costs. Energy storage in the form of heat is also significantly cheaper than battery storage of electricity, providing CSP with an economical means to overcome intermittency and deliver dispatchable power. In contrast to photovoltaic power plants, solar thermal power plants do not use semiconductor or other materials to produce electricity, they generate electricity directly from the heat produced by the sunlight. The process of manufacturing silicon produces byproducts that significantly increase the carbon footprint associated with PV versus solar thermal. Additionally, this means that solar panels (PV solar) are only effective during daylight hours because storing electricity is not a particularly efficient process. Heat storage is a far easier and efficient method, which is what makes solar thermal so attractive for large-scale energy production. Heat can be stored during the day and then converted into electricity at night. Solar thermal plants that have storage capacities can drastically improve both the economics and the dispatchability of solar electricity. Another difference between photovoltaic and solar thermal power plants is related to solar irradiance, which consists of direct and diffuse irradiation. When the sky is overcast, there is no direct irradiation, only diffuse. While solar thermal systems can utilize only direct irradiation for power generation, photovoltaic solar power plants can utilize both types of radiation. This places some additional limitations on the locations that solar thermal power plants will thrive; which includes the Southwestern U.S. deserts, Southern Europe, and North Africa. The United States and Spain are leading the world in the development of solar thermal power, with a combined total of over 5,600 megawatts of new capacity expected to come online by 2012. More than a dozen new CSP plants are in the planning stages in the United States, including the Mojave Solar Park in Southern California, the Solar One and Two projects in California, a 300-megawatt facility in Florida, and the Solana plant in Southern Arizona. According to a report from the Center for American Progress and Worldwide Institute, resource calculations show that just seven states in the U.S. southwest could provide more than 7 million MW of solar generating capacity - close to ten times the total capacity that currently exists in the U.S. today! Clearly, there is much more work to be done to support this under-utilized source of clean, renewable energy, but a good start is underway in some areas of the world. The following is a only brief list of some of the solar thermal plants that are either online or in the planning and development stages. The first domestic commercial parabolic trough power plant was built in the Mojave desert in California in 1984. By 1991, a total of nine trough power plants had been erected at the site with a total capacity of 354 MW, producing enough power for 100,000 homes. Eight of these have the capacity to be driven by fossil fuels as well, providing electricity both at night and in inclement weather conditions. In June of 2007, the Nevada Solar One CSP power plant began officially collecting solar radiation needed to generate clean energy for Nevada homes. Built by Acciona Solar Power, the 64 MW solar thermal power plant covers 400 acres and uses the solar parabolic trough technology. Nevada Solar One will generate up to 134 million kW hours of electricity per year, enough energy to power more than 15,000 U.S. households annually. It is estimated that the use of solar thermal power to produce electricity at Nevada Solar One in place of fossil fuels is equivalent to eliminating the carbon dioxide emissions from at least 20,000 vehicles. The Solana Generating Station is a 280 MW concentrating solar power (CSP) plant to be built 70 miles southwest of Phoenix. It will produce enough energy to serve 70,000 Arizona Public Service (APS) customers when operating at full capacity. The plant will be built by Abengoa Solar Inc., and is scheduled to provide renewable energy beginning in 2012. Solana will not emit greenhouse gases and will provide APS with more solar electricity per customer than any utility in the U.S. The facility also would be the largest solar power plant in the world if in operation today. BrightSource Energy out of Oakland, CA, entered into a series of power purchase agreements with Pacific Gas and Electric Company in March 2008 for up to 900MW of electricity, the largest solar power commitment ever made by a utility. BrightSource is currently developing a number of solar power plants in Southern California, with construction of the first plant planned to start in 2009. BrightSource will build a 100 MW solar plant in Ivanpah, CA that will start operating in 2011. The company is scheduled to build a 200 MW solar plant the year after that, and a second plant the following year, according to BrightSource CEO John Woolard. While the first two plants will go up in Ivanpah, the remaining power plants will be built in nearby Broadwell, California. Planta Solar (PS10), an 11-megawatt solar thermal power plant at Sanl�car in Spain's Seville province, was inaugurated March 30, 2007. Now producing power for Spain's electricity grid, it is the first solar plant developed in Spain by the Abengoa Group of Seville, and utilizes a specially designed steam turbine-generator supplied by GE Oil & Gas. More than 60 solar thermal power plants are in the construction, planning and development stages in Spain, with 2,570 megawatts expected to come online by 2012. Florida Power & Light Company (FPL) broke ground on the 75 MW Martin solar-thermal power station in Florida on December 2, 2008. The facility, which is expected to enter service in 2010, will combine solar-thermal with a combined-cycle natural gas-fired power plant to use less fossil fuel when heat from the sun is available to produce steam needed to generate electricity. It will consist of about 180,000 mirrors over roughly 500 acres at FPL's existing 3,657 MW Martin natural gas/oil-fired power station in Martin County. According to FPL, the solar-thermal station will provide sufficent power to serve approximately 11,000 homes, while preventing the emissions of more than 2.75 million tons of greenhouse gases. According to the U.S. Environmental Protection Agency, this is the equivalent of removing more than 18,700 cars from the road every year for the life of the project. In May 2008, the German Solar Power Group GmbH and the Spanish Laer S.L. agreed the joint execution of a solar thermal power plant in central Spain. The planned size of the power plant will be 10 MW a solar thermal collector field with a fossil co-firing unit as backup system. The start of construction is scheduled for 2009. In Summary: Utilizing simply 1% of the planet's deserts to produce clean solar electric energy would provide more electricity than is currently being produced on the entire planet by fossil fuels. Because it reduces U.S. dependency on fossil fuels to generate electricity, solar thermal power could potentially be a major source of renewable energy for the southwestern United States and sun-belt areas around the world. In the southwestern U.S., the electricity generated from CSP plants costs approximately 13�17� per kilowatt-hour, demonstrating that this technology is competitive today with simple-cycle natural gas-fired power plants. The U.S. Department of Energy has set goals to reduce CSP costs to 7�10� per kilowatt-hour by 2015 and to 5�7� per kilowatt-hour by 2020, which would make this technology competitive with fossil-fuel-based power sources.